Playing over the board requires a different skill-set to playing online. One of the key differences is the requirement to write down your moves on a scoresheet. There are several reasons for this requirement, one of which is that you need to prove a claim for a draw on three-fold repetition or the 50 move rule. I played in a tournament earlier this month which provided the opportunity to remind me just how important it is to keep a proper scoresheet. My opponent in the second round was an eight year old boy. He was rated just over 1500 (107 ECF), so a bit higher than me. I played with the white pieces and as expected, he tried to play a sharp game. 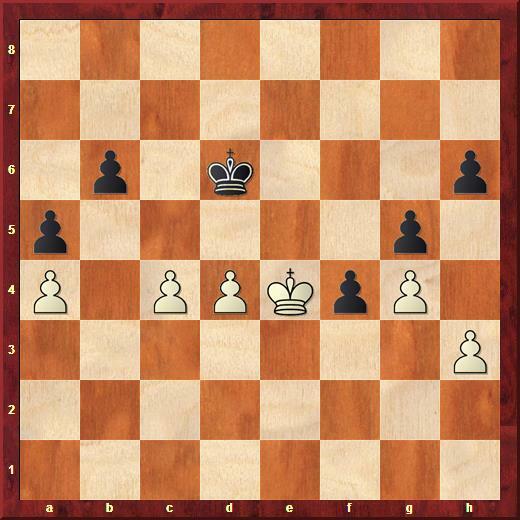 I got through the opening with equality and exchanged off major pieces when he started to threaten with tactics that my old head could not calculate quickly enough. We entered the endgame with a knight and five pawns each, he with two islands (a-b and f-g-h) and me with three (a-b, d and g-h). I gave him the opportunity to trade the knights off, capturing with my b-pawn to have an extra central pawn. We each made a few pawn moves, until we reached this position after move 44. This felt like a draw and given my opponent was higher rated and I had 16 minutes left against his 31 minutes, I was happy to take a draw. So I offered a draw, but was refused. I could see that there was no way in for his king, even if my king stepped back, and that any pawn move for him would lose. So I moved my king between f3 and e4, while his king did a drunken dance across all files of the 6th, 7th and 8th ranks. I offered a draw again shortly after and again was refused. My opponent clearly also saw that any pawn move was a loss for him, so all I can think is that he though he could win on time. The speed at which he started to move his king also supported this. Between moves, I checked my scoresheet and saw that we had the same position at least three times, so I offered a draw again, and when I was refused again, called over the arbiter. He already knew what I was going to ask, as he had been watching our game from a distance. He took us to a separate room where we set up the position I claimed we had repeated three times. He then asked that we play through the game and I was quick to point out that we should use my scoresheet, since my young opponent had missed several moves early on, and had stopped writing his moves down about 10 moves ago (incidentally a rule breach, since he was not in the last five minutes of the game, but I let that pass). We played through until I had to admit, as if my red face wasn’t enough evidence, that I too had made a mistake on my scoresheet. In the moves where I was checking for repetition, while moving my king between e4 and f3 and writing down scores following my opponent’s hasty moves, I had incorrectly recorded one move. I pointed out that the specific position was just one example of where we had repeated three times; there was at least one other. But because I had not claimed a draw for that other position, the arbiter could not consider it. He asked that we resume the game and that I should claim the draw at a position where we repeat for the third time. Fortunately the young tyro had realised by now that a draw was inevitable, so when I asked if he wanted to resume given we are bound to draw unless he moves a pawn, he agreed to the draw. Moral of the story – it is a good habit to keep an accurate scoresheet, not only so that you can analyse your games after the event, but so that you can call on your sheet as evidence to support a draw claim. I have to say I really dislike opponents who reject claims of draw by repetition. I’ve had it happen to me twice in recent years. The first time I was too unsure of myself to press it (and eventually drew in any case). The second time I didn’t back down and it was still annoying, but at least I made sure it was clear in my mind. (I should have looked for an endgame advantage instead, but that’s another story…) In any event, a cautionary tale. You’ll be be glad to retrieve these score sheets when writing your own “How I became a CM” highlights.